Simple and elegant – this is a fine archival quality canvas. This is our best rendition available for your image. The canvas material depicts your image with great detail, saturated colors and a nice smooth finish. With the “Gallery Wrap” the image stretched over the entire piece, including the sides. The canvas also is ready to hang and requires no framing! 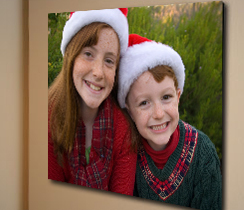 Canvas is printed with your photo, laminated, stretched and hand mounted on 1 3/8 inch bars. Our beautiful “gallery wrap” style of canvas requires no frame.